The John Lewis Partnership is today relaunching its two brands as John Lewis & Partners and Waitrose & Partners with a new visual identity and the start of the first ever joint marketing campaign for the department store and supermarket. The new design scheme, developed by Pentagram, uses the same elements across both brands, with subtle differences: while John Lewis now uses mostly black, Waitrose continues to use green. 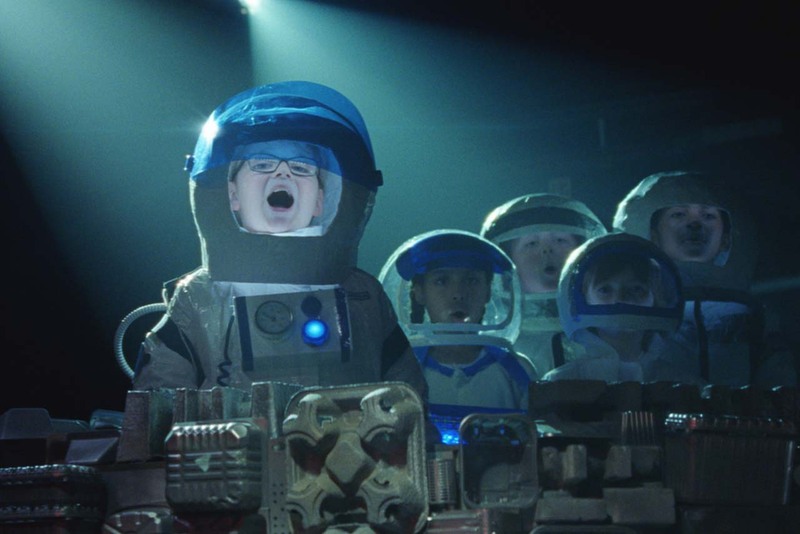 The ambitious campaign from Adam & Eve/DDB will include multiple executions, but kicks off with a 150-second film in which a group of schoolchildren stage a theatrical reimagining of Queen’s Bohemian Rhapsody. It debuts on social this morning, and will air on TV for the first time during tonight’s The Great British Bake Off. Speaking exclusively to Campaign, John Lewis customer director Craig Inglis and his Waitrose counterpart, Martin George, said the project was about addressing a number of different challenges facing the business. One of these was a need for a design scheme that was fit for purpose in digital, and especially mobile, channels, Inglis said. "The current identities were created about 17 years ago and it was a very different time," he said. "If you think about the number of touchpoints we were using at the time – it was basically created for bags, vehicles and for a letterhead. It was very utilitarian. It’s performed its job really well but we needed to make the shift." The other initial motivation was John Lewis’ increased emphasis on fashion, he added: "It’s hugely important to us, especially in own brand, and we just didn’t feel the identity we had was reflective of the modern progressive brand we wanted to be." Each of the new logos uses capitalised text in a fine sans serif typeface, inside a rectangular design that reimagines the familiar stripes of previous logos. The logo shape can also be used without text, and is designed to be suitable for all possible contexts. The new look appears from this morning on the facade of John Lewis Oxford Street, which has been given a full facelift – as can be seen in the timelapse video below – and its stores in Westfield White City and Milton Keynes, plus two London branches of Waitrose. All digital channels have already been switched over, and the new visuals will also start to appear quickly on carrier bags, uniforms, store magazines, point of sale displays and new product ranges. By the end of the year, around 15 Waitrose stores will have been fully converted. But it will take around five years before the full store network, all of the company’s vehicles, and all product ranges bear the new branding, with many updates scheduled to coincide with refurbishment plans. The process started about four years ago, and early on, Inglis said, "it became clear that elevating our partners was the right strategy. We felt that partners are our secret weapon – they need to be at the heart of our brand. And in the process of doing that, it became clear that this was not just a John Lewis story, it was about both brands." The rebrand and joint campaign will have a particular benefit for Waitrose in terms of consumer education, George said: "The research we did said that a significant number of customers didn’t recognise that we are part of the John Lewis Partnership – and when you told people you were, that’s a huge positive for us." But while the business knew its partnership model was a key USP, that was "quite a complicated notion" for consumers to understand, George said – something he had learned from his time at Bupa, when the healthcare provider had considered advertising its status as a provident (a type of not-for-profit company). "Customers came back and said to us: I don’t really care actually, unless the service I receive is better, and you can demonstrate why it’s better," he said. "So we’re conscious that we have to go through an exercise of translating the thought of what a partnership is into something that really matters to customers." As a result, the TV ad is supported by a second key execution, a "manifesto" appearing in print ads and in a film played within stores and online. It reads: "When you’re part of it, you put your heart into it. 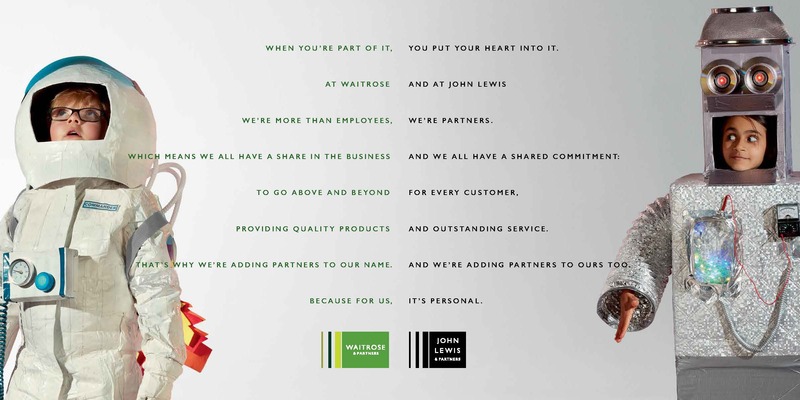 At Waitrose and John Lewis, we’re more than employees. We’re partners. Which means we all have a share in the business and we all have a shared commitment: to go above and beyond for every customer, providing quality products and outstanding service. That’s why we’re adding partners to our name. Because for us, it’s personal." This will be followed by a series of print ads and content, focusing on fashion and furniture for John Lewis, and different types of food for Waitrose, which will bring individual partners to the fore, outlining the specific contribution they make to the business. 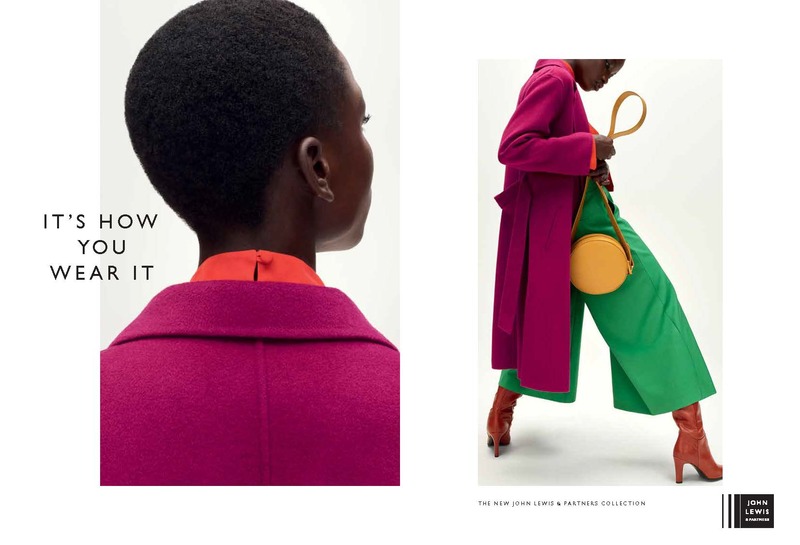 John Lewis’ biggest ever womenswear collection, created in-house and labelled John Lewis & Partners, launches today, and will also be advertised with a Tube station takeover at Oxford Circus and London bus wraps on routes that serve Oxford Street. The initial campaign will run into early November, when it will be replaced by a Christmas campaign or campaigns – though Inglis would not comment on whether this would also use a combined approach. But he added: "This isn’t a drop in the ocean, it’s not a one month campaign – it’s a statement of intent."